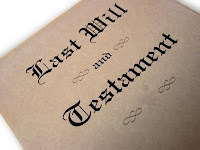 The Last Will and Testament of John Calvin. In the name of God, I, John Calvin, servant of the Word of God in the church of Geneva,...thank God that He has shown not only mercy toward me, His poor creature, and...has suffered me in all sins and weaknesses, but what is much more, that He has made me a partaker of His grace to serve Him through my work...I confess to live and die in this faith which has given me, inasmuch as I have no other hope or refuge than His predestination upon which my entire salvation is grounded. I embrace the grace which He has offered me in our Lord Jesus Christ and accept the merits of His suffering and dying, that through them all my sins are buried; and I humbly beg Him to wash me and cleanse me with the blood of our great Redeemer,...so that I, when I shall appear before His face may bear His likeness. Moreover, I declare that I endeavored to teach His Word undefiled and to expound Holy Scripture faithfully, according to the measure of grace which He has given me. Having been a spectator of his conduct for sixteen years, I have given a faithful account both of his life and of his death, and I can now declare, that in him all men may see a most beautiful example of Christian Character, an example which it is as easy to slander as it is difficult to imitate. It is appropriate that Calvin's last words - "How long, O Lord?" - were the words of Scripture. He literally died quoting the Bible he preached, having expended himself in the work and will of God, faithful to the very end. 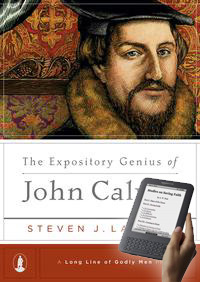 In The Expository Genius of John Calvin, Dr. Steven J. Lawson delves into the practices, commitments, and techniques that made John Calvin, the great Reformer of the sixteenth century, such an effective preacher during his long pastorate at Saint Pierre Cathedral in Geneva, Switzerland. Dr. Lawson identifies thirty-two distinctives of Calvin s preaching, providing comments from Calvin s writings, quotations from Reformation scholars, and examples from Calvin s own sermons to reinforce his points. In the end, Dr. Lawson finds in Calvin a strong model for expository preaching and calls on modern pastors to follow the Reformer s example.